Automated cranes and other systems located at ports in Los Angeles and Long Beach, Calif.; Bayonne, N.J., and Portsmouth, Va., have started to allow motor carriers to load and unload containers at terminals in much faster times than before. More efficiently and densely stacked containers at ports also help to reduce the amount of land space required by port infrastructures to operate. Eventually, autonomous trucks and self-piloting ships might one day begin entering and leaving these autonomous ports. But the most immediate benefit provided by these automated ports is reducing the amount of time it takes a carrier to enter a terminal and deliver or pick up a container load. These turn times — at terminals with or without automated cranes and equipment — vary from terminal to terminal, and also depend, of course, on the amount of container traffic that peaks at different times. On the West Coast, Robert Loya, director of operations at CMI Transportation, said turn times for his firm’s trucks vary from 30 to 50 minutes at the automated Long Beach Container Terminal, while turn times vary from 50 to 70 minutes at the TraPac terminal in Los Angeles. The discrepancy in time is due to how the Long Beach terminal is a greenfield-built terminal while TraPac’s automated infrastructure was rebuilt on an existing facility that has replaced man-operated cranes, he said. Comparatively, turn times at non-automated terminals at Los Angeles and Long Beach ports typically take more than an hour, which can easily increase to an hour and a half or longer if there is congestion, Loya said. On the East Coast, meanwhile, at the GCT Bayonne terminal in Bayonne, near the New York and New Jersey harbor entrance, the average delivery time at the 167 acres where semi-automated cranes are in operation is typically less than 45 minutes or just less than an hour to both drop off and pick up loads, according to terminal data. This typically compares to load and drop-off times of about two hours at some other terminals in the New York and New Jersey bay area. Overall, motor carriers have little to do to prepare to send their trucks to automated terminals, besides having to often place an RFID tag on their vehicles for automated tracking purposes upon arrival. Drivers typically take a short introductory course to learn how and where to stand in a safety zone as their trucks are loaded and unloaded. As for the logistics of all this automation, when a ship arrives at an automated port, massive cranes unload the multicolored containers from the ship and onto the dock. Robotically controlled straddle carriers typically lift the containers from the dock and move them on a rail system to a stacking yard. Stacking or side-feed cranes then lift the containers in stacks in the yard and are also used to load the containers on or off trucks or trains in this zone. Automated cranes thus represent the bare-bones infrastructure of an automated port. The leading suppliers include Kalmar, Konecranes and Liebherr. More automation at a container terminal also can allow for longer operating hours, said Timo Alho, vice president of terminal development at Kalmar. “Automation can help to keep cost of operations down, since it is likely that the terminal operators can extend their operating hours at night and on weekends, and in that way, they can offer better service to the trucking companies,” Alho said. In the big-picture sense, autonomous port equipment, such as autonomous cars and trucks, are, in theory, more reliable, predictable and efficient than humans are, said Jussi Sarpio, general manager for ASC and RMG Cranes at Konecranes. “Once the human factor is taken out of the equation, you see a huge jump in productivity,” Sarpio said. However, before automated loading equipment adoption ever becomes widespread, port operators and suppliers must ready the equipment and infrastructure first, which requires massive capital expenditures. According to port operators and analysts, the construction of an automated port typically costs well over $1 billion. 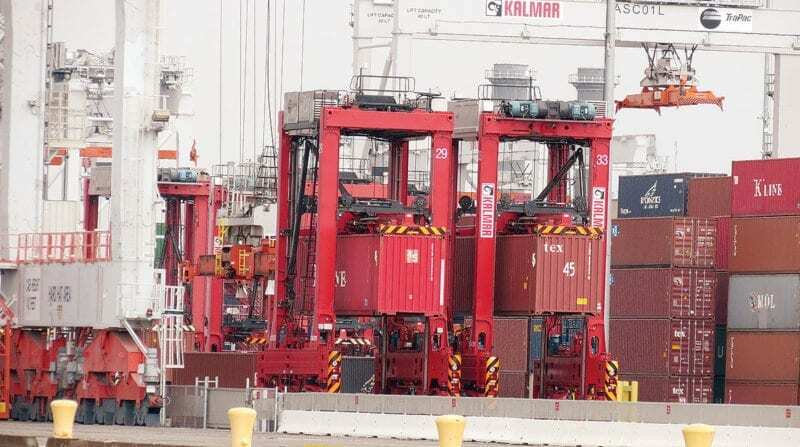 According to data compiled by Kalmar, automated gantry cranes, which are located in the stacking zones of a container terminal, are the most widely used type of equipment enabling the automation of container stacking in container yards and on trucks. These cranes fall under two different categories: end-feed automatic stacking cranes (ASC) or side-feed ASCs. Currently, about 30 to 40 container terminals use ASCs globally, Kalmar said. Autonomous trucks and boats also will likely be deployed to deliver and load containers at automated ports, although observers do not expect that driverless vehicles and pilotless container boats will begin arriving at ports any time in the near future. “There are many bugs that exist for this last mile of autonomous trucks,” T.G.S. Transportation’s Schneider said, adding that his company has ordered an all-electric Tesla Semi that will include Tesla’s Autopilot automated driving capabilities. There are thousands of different docks out there that have all of the many variables that will pose challenges for self-driving trucks, but “that human drivers can do in their sleep, so to speak,” he said. However, the first autonomous container ships could begin to arrive at automated and non-automated terminals as early as next year, said Peter Due, director of autonomy at Kongsberg Maritime, which is designing and building an all-electric ship for Yara International ASA that is slated to begin shipments at ports in Norway in 2019. Meanwhile, the end result of self-piloting ships and port automation means fewer human workers will be required, which will become more of a consideration in the future as more automated ports are built. Other examples of autonomous boat projects include Wärtsilä’s debut of a working prototype of a remote-controlled container ship last year that self-piloted in the North Sea of Scotland. Rolls-Royce and Google are also working together to develop an autonomous ship. Neither company, however, has communicated a time when these vessels are expected to see commercial deployment. Kongsberg’s autonomous ship, besides helping to reduce emissions thanks to its electric-powered motor, also will help to make shipping safer because it will require fewer humans on board as the ship pilots itself, Due said.